The world of aviation needs more people like Barrington Irving, a 23-year old senior majoring in aerospace at Florida Memorial University. 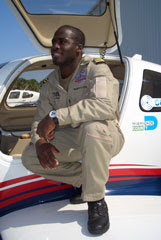 Later this spring, Irving will climb into a single-engine plane he calls "Inspiration," and embark on a round the world flight that will make him the first person of African descent and the youngest person ever to fly solo around the globe. As a teenager in inner-city Miami, Barrington and his friends shared a sense of hopelessness about their futures, as there was little incentive or opportunity for minority youth to pursue professional careers. He earned good grades in high school but saw a football scholarship as his only route to college. Then one afternoon, working in his parents' Christian bookstore, Barrington began talking with a customer, a Jamaican airline pilot, Captain Gary Robinson, who invited him to the airport the next day to see the cockpit of the Boeing 777 jet he flew for United Airlines. That day changed the young man’s life forever. The Columbia 400 aircraft that will carry Barrington on his World Flight Adventure has its own story. In 2003, Barrington began calling aircraft manufacturers with the unlikely request to borrow, lease, or donate a plane he could use to make aviation history. When no one said yes, he decided to ask manufacturers of the various components to donate just one of their individual products to him; he also asked Columbia, an aircraft manufacturer, whether they’d agree to assemble the plane if he could produce the parts. During the next year, with support and guidance from Miami Executive Aviation, he visited aviation trade shows throughout the country and secured more than $300,000 in donated components—the engine, tires, cockpit systems, seats, and so forth—and Columbia built him the world’s fastest single-engine piston airplane, ready to be modified with extended fuel tanks a few weeks before the global flight. I love this story...it is the very essence of what being an aviator is all about. Barrington's determination to achieve a very lofty aviation goal is proof positive that general aviation is very much alive and well, and shows we still have the ability as aviators to impact the lives of those much younger than us. This is a story I will be following in this blog. And if you feel the need to help out, click here to learn about becoming a sponsor, or download the sponsor contribution form here.